Two Transit Connect Electric vans have successfully completed a 75-mile route from Oxford to London in a convoy of electric, hybrid and low-emission vehicles, as part of the 2011 Bridgestone Eco Rally. The rally took place on Sunday 31st July, this year starting from Broad Street, Oxford and finishing in the UK's largest sustainable transport exhibition at The Mall in London. The convoy comprised more than 30 of the latest low and zero emission vehicles including cars, motorbikes, vans, trucks and taxis. Graham Hoare, executive director powertrain engineering, Ford of Europe, said: "Ford is developing a portfolio of electric vehicles that offer customers affordable, environmentally friendly technologies in vehicles they want and value. The Bridgestone Eco-Rally is a great opportunity to showcase the first of these vehicles to go on sale, the Transit Connect Electric." 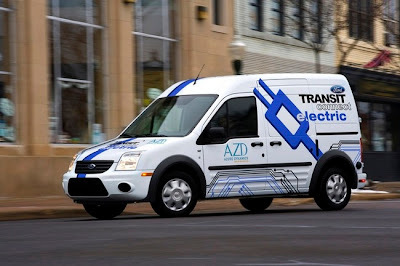 The Transit Connect Electric, developed in conjunction with Ford's electric vehicles partner, Azure Dynamics, is the first of five electrified Ford models to be made available in Europe. It is a pure electric-powered version of the award-winning Transit Connect light commercial vehicle. It has a proprietary Force Drive™ battery electric drivetrain powered by an advanced battery pack from Johnson Controls, carrying a range of up to 80 miles with a payload of up to 500kg. Ford has committed to introduce five full-electric and hybrid models in Europe by 2013 as part of its global electrification strategy. These include the Transit Connect Electric this year, the next generation Ford Focus Electric in 2012, followed by hybrid and plug-in hybrid derivatives of the all-new C-MAX and another hybrid-electric model in 2013.